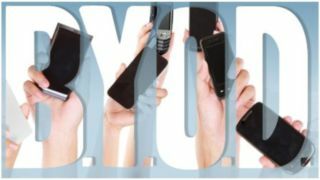 The Bring Your Own Device (BYOD) trend has been driven by the consumerisation of IT. Employees no longer want to be tied to using old technology and devices often imposed on them by their IT department. What they want instead is the right to use the new technologies and devices in the workplace that are making their personal lives easier and more efficient. With the proliferation of new devices and the adoption of BYOD policies within global businesses, it has been predicted that the BYOD trend will continue. A recent report by Juniper Research, states that the number of employee owned devices in the work place, such as smartphones and tablets, is set to exceed 1 billion in the next five years. One of the reasons behind the adoption of BYOD policies is the perceived cost and time saving benefits of letting the user purchase and upgrade their own choice of device. However, with these benefits comes an even bigger headache for the IT department - the time and cost of deciding upon then implementing and securing a BYOD policy. If a stringent BYOD policy is not implemented and communicated correctly, then BYOD can pose a real risk to an organisation's network security. According to Ovum, 70 per cent of smart device-owning employees now use their personal phones or tablets to access company data. While a convenience for the employee, it can be a nightmare for the IT department, as not all consumer devices offer the enterprise-level security features to keep the data safe. As a result, if the device is lost or stolen then the data could be accessed and the corporate network compromised. In addition, the growing use of applications can also pose a risk to unsecured devices. A report from Trend Micro found that the number of malicious applications available for the Google Android operating system alone rose to 718,000 at the end of the second quarter of 2013. IT departments have very limited control over third party applications that are downloaded by employees onto their personal devices. Furthermore any security measures that are introduced onto an employee's personal device can quickly be undone by a user wanting to improve performance or perform a task that would not be allowed under the settings imposed by the IT department to protect the network. There are a range of options and solutions that can be adopted by businesses to ensure that their BYOD strategy is as secure and effective as possible. However, a typical mobile BYOD environment can cost 33 per cent more than a well-managed wireless deployment where the company owns the devices. So, what if BYOD was not the only option for those wanting to be able to use the latest technologies and devices in the workplace? There is another solution available and for this we have to return back to the commercial PC. Innovative companies are now designing and offering commercial products that are as innovative, attractive and appealing as the latest consumer devices available on the market. These products are able to bridge the divide between consumer and commercial PCs and the birth of a new trend has emerged - Leave Your Own Device (LYOD). LYOD has the potential to be even more seismic than BYOD. New thin and light devices will continue to be brought to market that allow employees to be more mobile, more productive through PCs that are managed centrally by the IT department and more comfortable with the computer that they use on a daily basis at work. With products on the market like this, BYOD policies can seem like an unnecessary expense for the IT department. What's more, it's a win-win situation for the business. The employee is happy with the new devices s/he has been given and the IT department no longer has the unnecessary cost and headache of deploying BYOD policies. With LYOD we are moving into an era where the latest devices for the enterprise will provide inspiration for our own personal computer purchases and not the other way around. James Morrish is Chief Technologist for HP UK & Ireland.